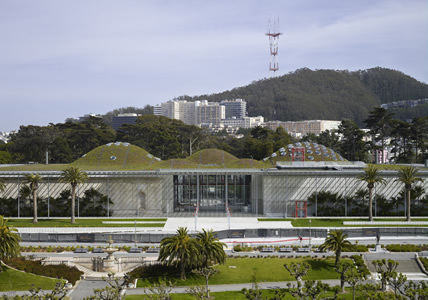 The newly remodeled California Academy of Sciences, located in San Francisco’s Golden Gate Park across from the almost-new (2006) de Young Museum, is not your grandmother’s natural history museum. Or even your mother’s. That’s both good and not so good. The Academy, founded in 1853 as the first science museum in the West, has always contained a conglomeration of many features: Planetarium. Aquarium. Dioramas of large taxidermied mammals. All that, and more, is still present in the new building, designed by Pritzker Prize winning architect Renzo Piano. The Academy moved to Golden Gate Park in 1916 after its previous downtown building was destroyed by the 1906 earthquake; the building was much added to and modified, and more buildings were added. Its dark old interiors are gone. Instead, entering the rectangular glass-walled building into a large “piazza,” we’re faced with a four-story interior glass bubble, which houses the Rainforests of the World exhibit, focusing on Borneo, Madagascar, Costa Rica, and the Amazon. Other exhibit areas, arrayed around, above and below the bubble, include the “living roof,” an expanse of more than 50 species of native California plants built over a 2.5 acre area that includes seven hills (three large and four small), and viewable from a platform. The rain forest exhibit includes, of course, plants and trees, many of them looking like houseplants on steroids, as well as insects (including butterflies), and 40 specimens of birds. Access is via ramp or elevator. There aren’t any mammals—at least not yet. And yes, it’s hot and humid in there. The rain forest theme continues on the lowest floor with the Amazonian Flooded Rain Forest, where piranhas and other critters you wouldn’t want to meet in a dark alley hang out safely in an acrylic tunnel that you can walk under. The whole lower floor is given over to water, and includes Water Planet (over 100 tanks, small to large, housing fish, reptiles, and other watery folk), and the Swamp, where Claude, an albino alligator, and his darker alligator buddy hang out. When I visited, Claude was splayed out immobile on the heated rock situated in the middle of his habitat, which is also shared with turtles, frogs, and salamanders. The bronze seahorse railings and hand-painted tiles which decorated the original 1923 exhibit have been preserved. Among the most stunning exhibits is the Coral Reef, a tank holding 212,000 gallons of water and some 2,000 fish—not to mention the living corals, natives of the Philippines. Imagine looking at a giant fish tank filled with brilliantly-colored fish and corals. It’s the second largest coral reef exhibit in the world (next to Townsville, Australia’s), and the world’s deepest. In the middle of the lower level is the Water Planet, which I found distractingly noisy and busy. What I took at first to be temporary plastic wrapping on the walls holding the tanks turns out to be a permanent installation meant to suggest waves. “Watery” music fills the air, as do the sounds of the different interactive exhibits. Young kids—and much of the Academy’s thrust is educational—are used to noise and chaos, but I for one prefer to contemplate the wonders of the deep in silence. No such luck! On the other hand, I wouldn’t have wanted to miss seeing Buccalo, a giant sea bass about the size of a small sofa and still growing. He’s been a resident of the Academy since 1979 or 1980. When he turns to look at you full-face (huge eyes, blubbery lips), you could think he was created in an animation workshop. Look out, Nemo! Back on the first floor is the African Hall, the only hall from the original building reproduced in almost original form. Ranged along the side walls are 21 dioramas containing animals (not live) such as lions, baboons, cheetahs, antelopes, and more as well as some smaller live animals—chameleons, tortoises, and the like. And at the end of the hall is what’s sure to become one of the Academy’s main draws: the African penguins, some 20 of the little critters about one to two feet tall, diving, swimming, and playing in the water and among the fake rocks. When I visited, a naturalist was in the tank with the birds, who flocked to her, letting her cuddle them and tickle their necks. Aww! Also on the first floor are the Academy’s display on evolution (“Islands of Evolution: Madagascar” and “Islands of Evolution: Galapagos”) and “Altered State: Climate Change in California.” Not only do we learn about climate change, but we’re also shown what we can do to mitigate it by modifying our own habits. And here’s where the Academy’s didactic mode goes into full throttle. The Academy is all about “the emergence of life, the evolution of life, and the sustainability of life,” according to Executive Director Dr. Greg Farrington. All noble aims, but the exhibits never miss a chance to preach. Over the drinking fountains are messages about the evils of bottled water. Even the doors of the toilet stalls sport quotations about biodiversity and sustainability. I’m with you, guys, but enough already! Finally, though, we can escape earth at the Morrison Planetarium, where every hour on the half hour there’s a show, “Fragile Planet” (oh-oh—did we escape the message after all, or not? ), in which digital images swoop us from the Academy itself up, up, and away, beyond the solar system in search of other possible sites of life. The show is spectacular, but people like me who are susceptible to motion sickness might be advised to hang on to their seats. Or take a pre-show Dramamine. The Academy is open Monday through Saturday from 9:30 to 5, Sunday 11 to 5, closed Thanksgiving and Christmas. Admissions range from free (for children under 6) to $24.95 for adults. Various deals are available, and regular visitors will want to consider buying a membership.